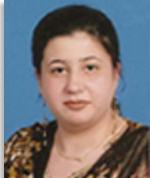 Ms. Farzeen Akram joined the Department as a Lecturer on February 26, 2103. She earned her Master’s degree in Philosophy from the University of the Punjab Lahore in 2004. She sets a new record in her M.A. Philosophy getting 100 % marks in the subject of Advance Formal Logic. She was awarded K. B. Sheikh Nanak Bakhsh Silver Medal, and Khawaja Ghulam Sadiq Gold Medal, and University Gold Medal from University of the Punjab Lahore. She is doing her M.Phil in Philosophy from the same department. Logic and Critical Thinking, Advance Formal Logic, Business Ethics, Environmental Ethics are her major areas of interest.